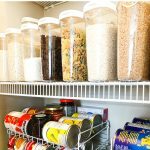 Simple and practical tips for Pantry Organization that work for Real Life. 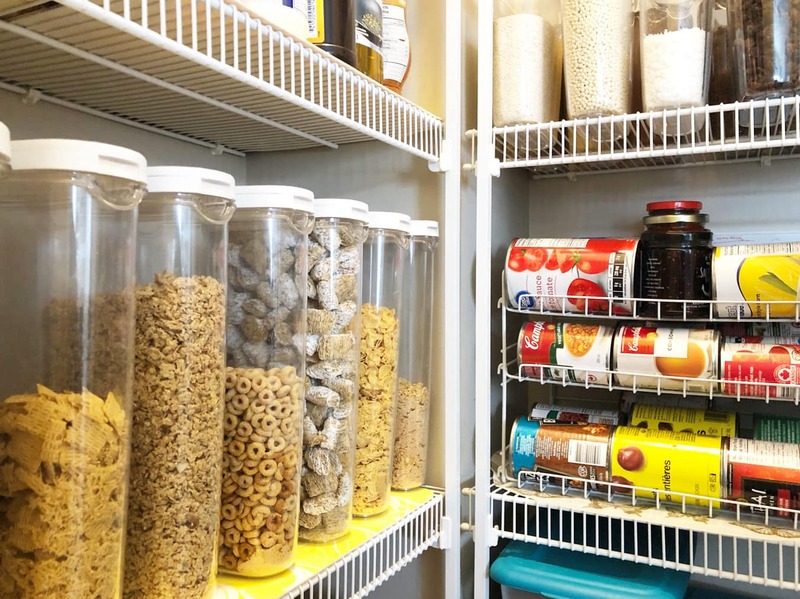 Get your dry baking goods, canned goods and cereal organized! 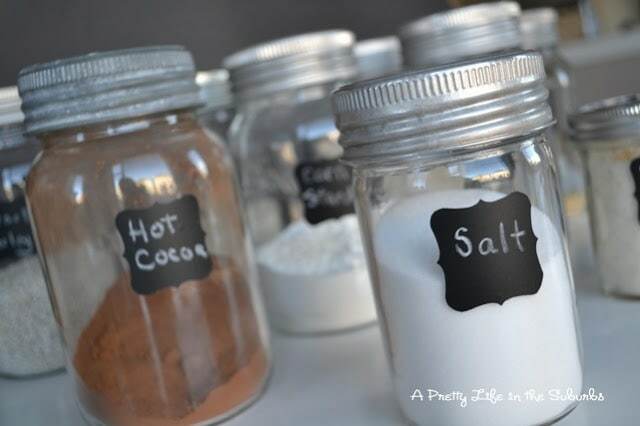 While I love a perfectly curated and organized pantry, they’re just not real life. You know the ones? 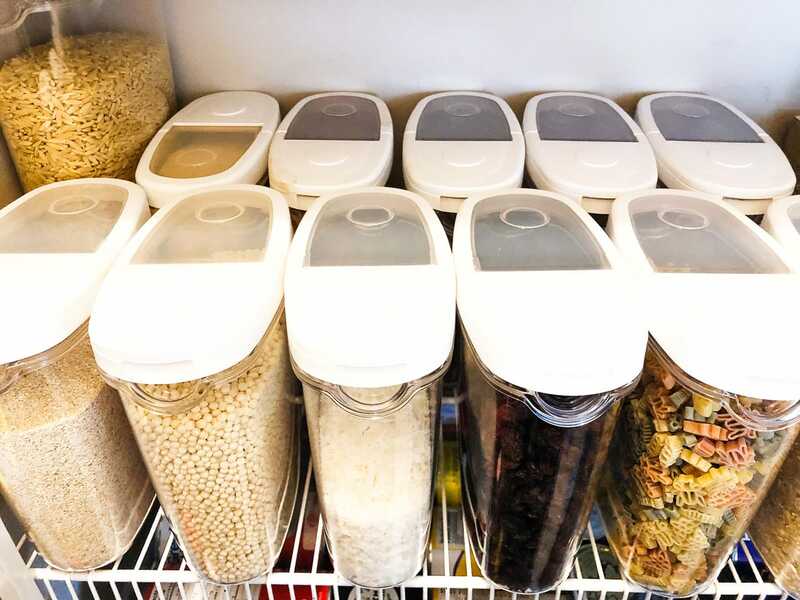 Where everything matches and every container is perfectly lined up, not a thing out of place. Certainly no floating packages of chocolate chips in there. I’m not knocking those pantries, because quite honestly, they are a dream for me. I would LOVE to love my pantry. But but for me, pantry perfection is just not possible, there are way too many moving parts around here. 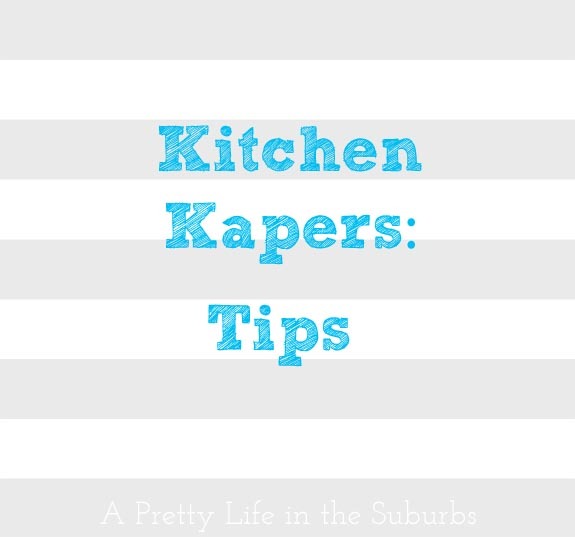 Instead I need a pantry that is functional, easy to navigate and easy to keep somewhat under control. Everything should be in its place and I need to be able to see it all at a glance. 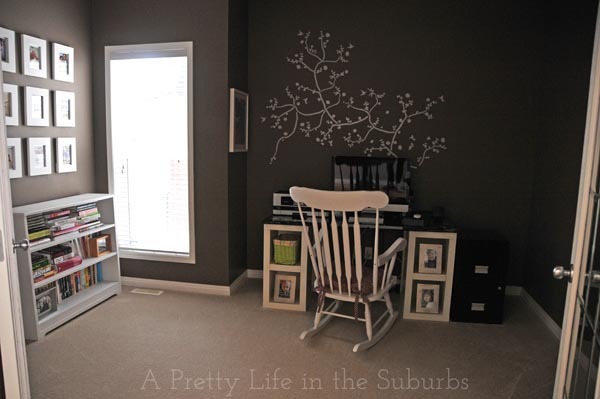 But I also need this without the added stress of trying to keep it looking like a showhome. I just can’t do that. 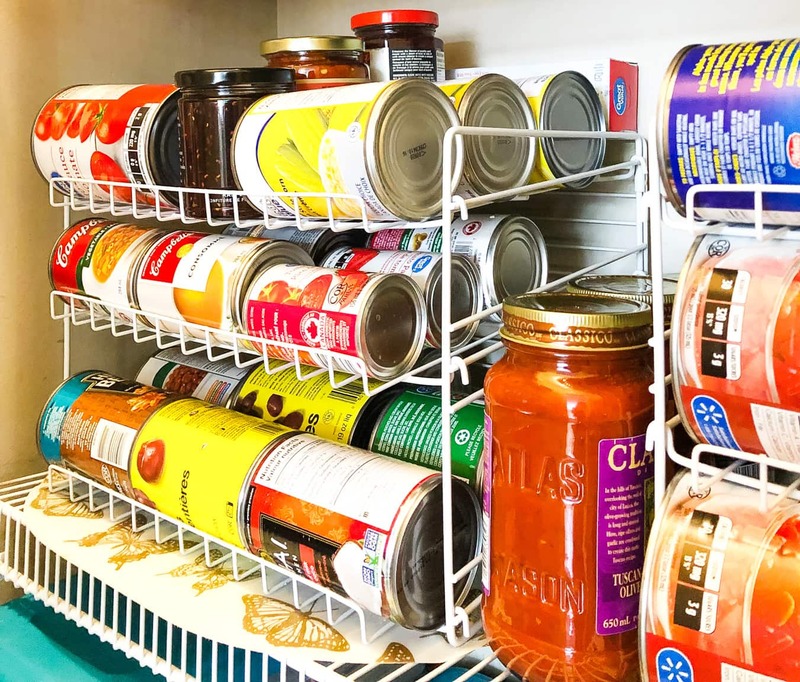 And since my pantry situation has been less than ideal, ok let’s be real…it’s been a hot mess, it was time to do something about it. I finally decided to take back control of my pantry after the hundredth time a container of coconut came flying out at me as I reached for the raisins. Ridiculous. Below is a picture of how my pantry looked BEFORE I made some simple changes. It’s not totally terrible (just a little a lot terrible), but it was frustrating. Containers stacked on top of each other that would come flying out whenever I tried to get something, bags half filled with stuff, just a mess. But life just happens like that when you have 5 people who use the pantry on a regular basis…things get messy. My Pantry BEFORE I got organizing! And the thing about pantries is that they are always changing. 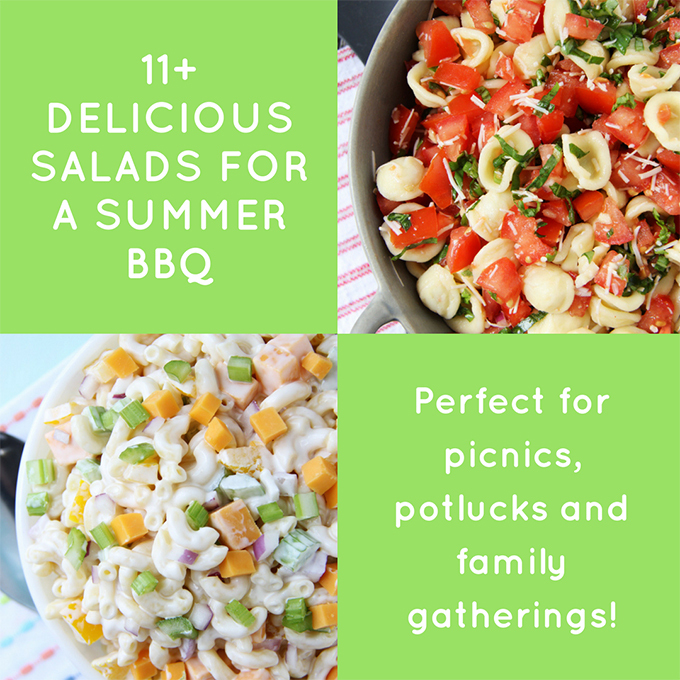 One minute they’re organized, and the next they’re a disaster again…it can be really hard to keep up with keeping things in order. 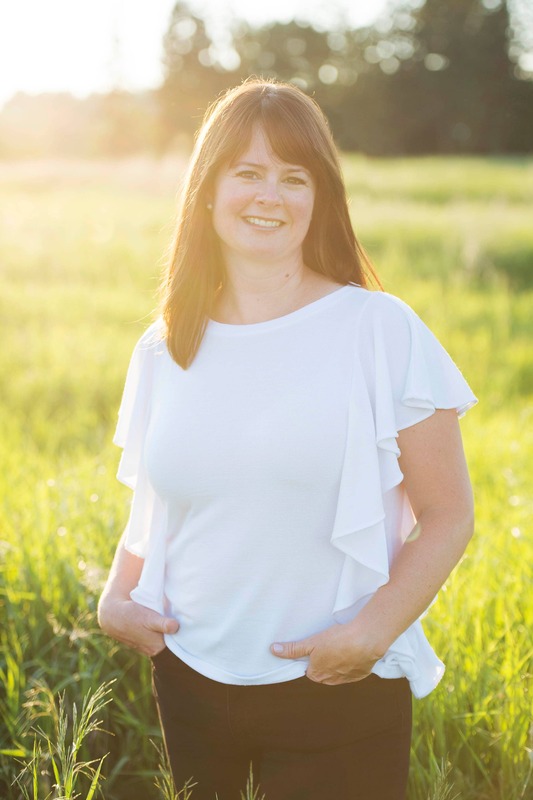 But I’ve learned that for myself and my family, that if there is a place, space or container for things, then organizing is easier. If there isn’t a place for things, that’s when containers start getting placed on top of each other and it gets real crazy real fast. So to try to combat this crazy, I went in search of containers that would line up neatly in my pantry. Now this is where things get real. Organization containers are EXPENSIVE. 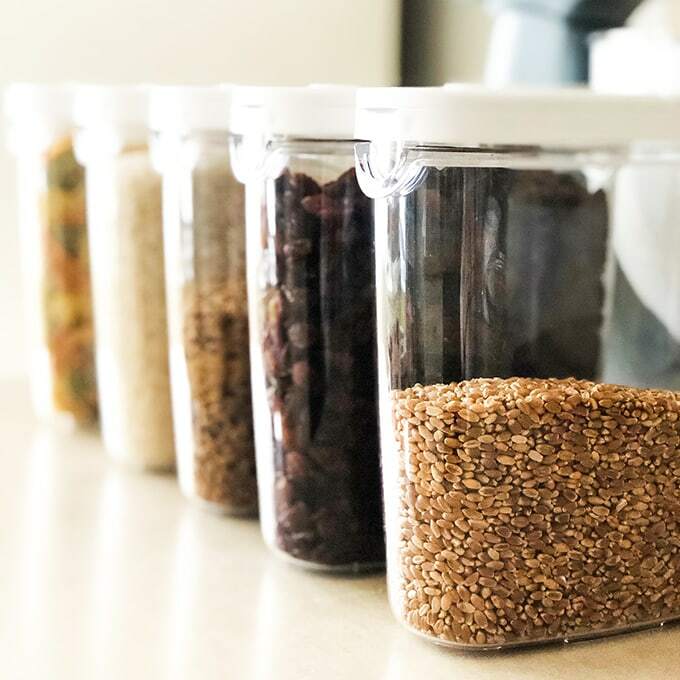 It’s not cheap to buy the containers needed to keep a pantry organized. 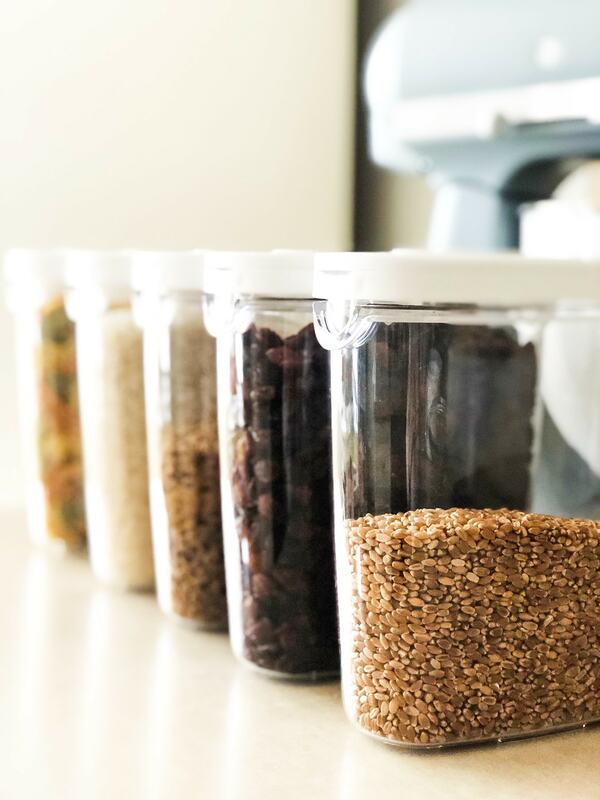 When each food grade container costs at least $7 to $10, and you need 10 or more of them, you’re already at at least $100…and it still won’t feel like you have enough. But I decided to make the investment. 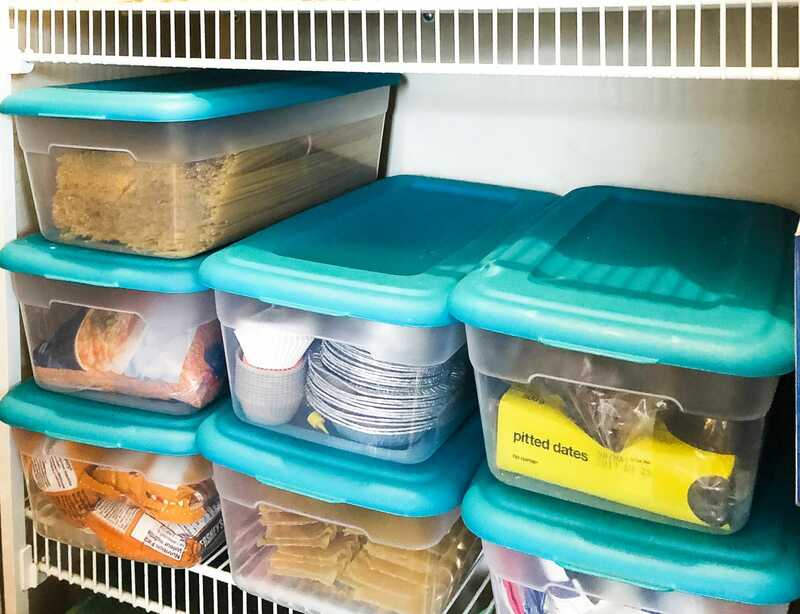 It was worth it to me because I knew that after I purchased what I needed, I wouldn’t have to do this kind of organizing project again for quite some time. This is a long term investment. 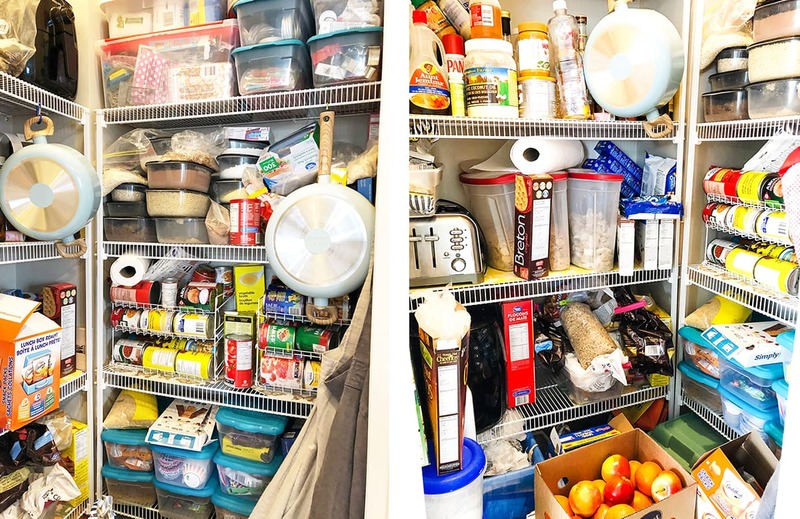 It can feel daunting to organize an entire pantry all at once, so don’t do it. Tackle only few things at one time. Choose a couple of shelves at a time, and start with the most used ones. I started with the cereal, baking goods and canned goods. That may seem like a lot but there are 6 other shelves in my pantry that need dealing with! haha. So with that in mind, I headed out in search of containers to help me organize these hard working shelves. 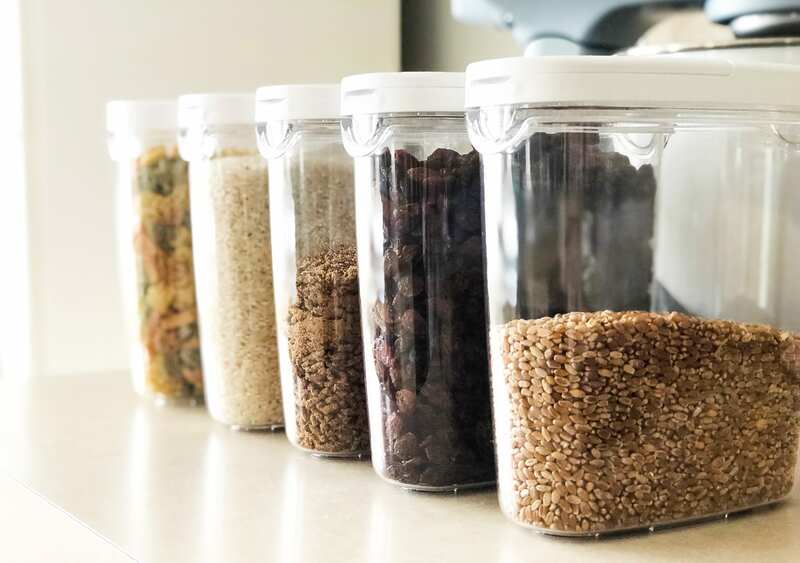 For cereal I bought these large transparent dry food storage containers from IKEA. 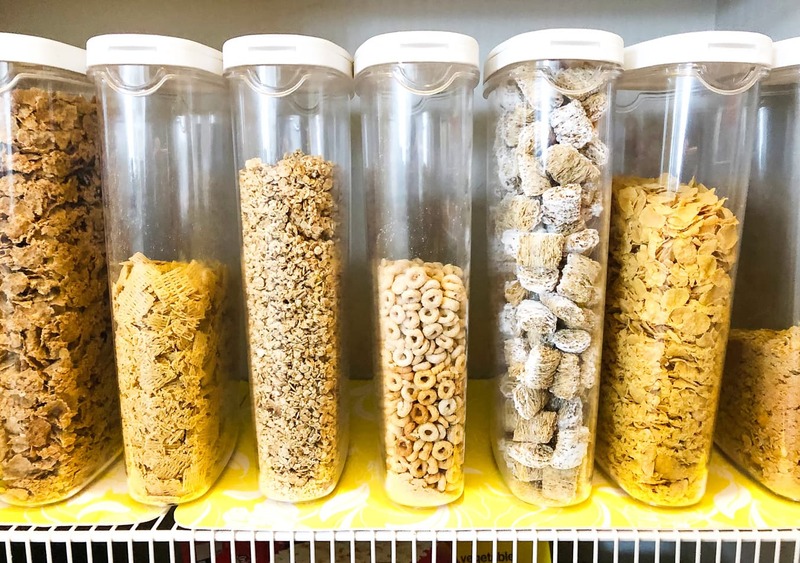 They line up neatly on the shelf so it’s easier than ever for the kids to choose their cereal in the morning. 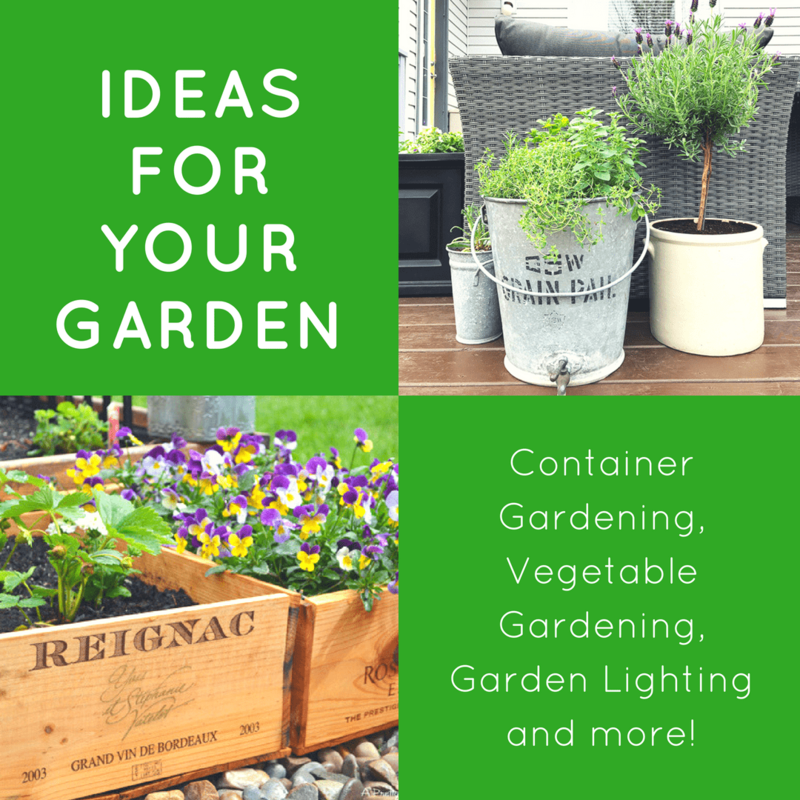 These cost $9.99 each which is cheaper than most containers that I could find. And honestly I do wish they were a little bigger, but anything bigger started to get into the $20+ range which I just didn’t want to spend. My biggest annoyance in my pantry was my baking area. I had containers stacked on top of containers on top of containers. I could never find anything and it drove me crazy. For this shelf I bought these small transparent storage containers from IKEA, and now I have everything stored away all nice and tidy. I LOVE it SO much. 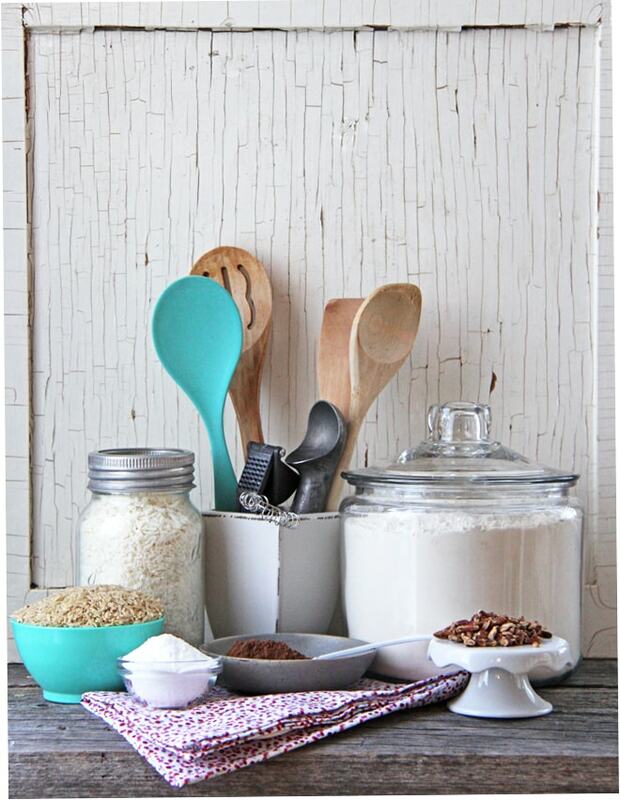 These containers are the perfect size for dry baking goods. 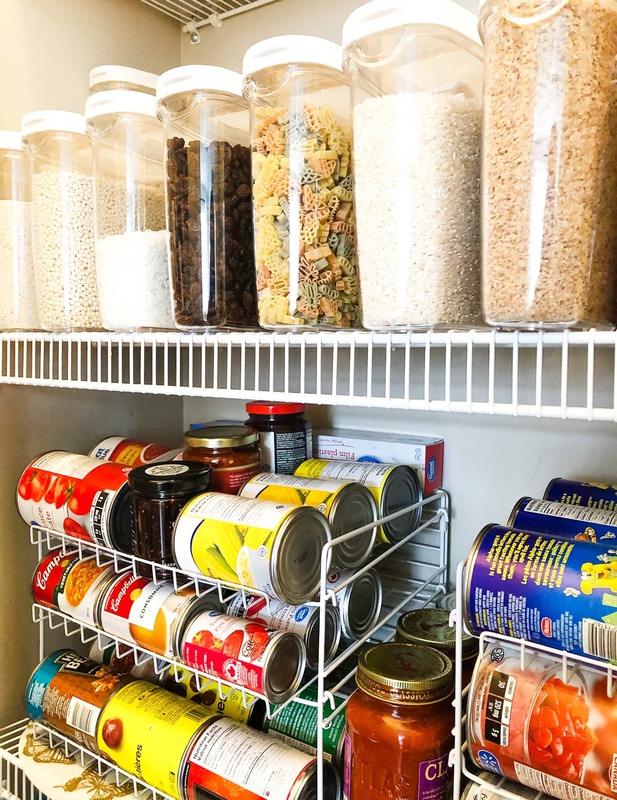 When I posted in my Instagram stories that I was organizing all my dry goods, a lot of people noticed my canned goods storage units. I actually bought these a couple of years ago at Winners/HomeSense and I love them. Having cans organized in this way makes finding what I need so easy. Another thing about pantries is the inevitable fact that there will always be random things with no place to go. 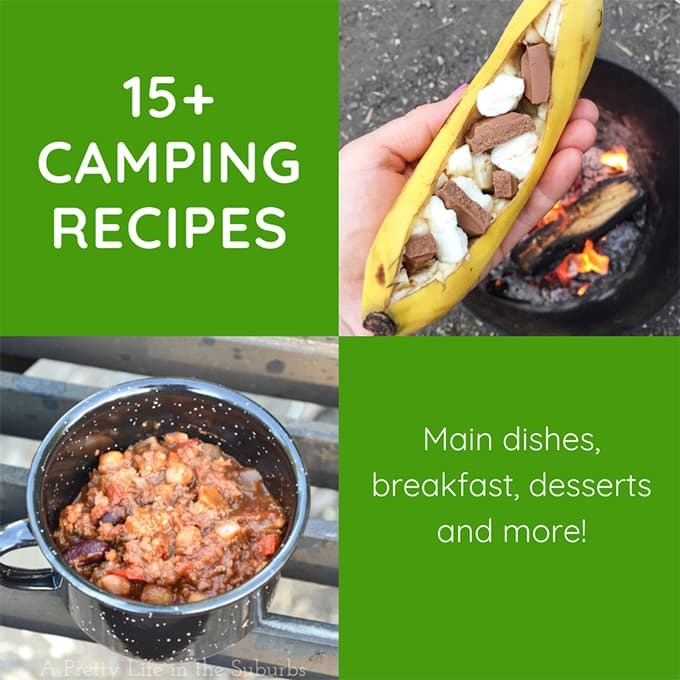 Things like gravy packets, bags of baking chips, muffin cups, and all kinds of random ingredients. I have found that the best way to deal with all of these things is to gather them up in storage bins. For example, all my baking chips are in one bin. I have spaghetti noodles in another. Raisins, dates, currants etc… in another bin. You get the idea. It’s just a really easy way to keep things together. For this storage I bought these rectangle plastic bins (with the teal lids) at Walmart. Here’s a bonus tip for you! 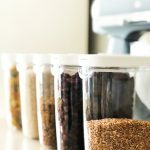 It’s not really a pantry organizing tip, but it happens to involve my pantry so I thought I would share it. One last issue I had left to tackle was where to store my many sauce pans and frying pans. I have quite a few, and I’m slowly donating ones that I don’t use anymore. But I still don’t have enough storage for them all…my kitchen is surprisingly lacking in drawer space. So I hang my most used pans in my pantry using carabiners (I plan on purchasing some proper pan hooks one of these days). Now my pans hang nicely from the wiring in my pantry and they’re really easy to access. Sometimes it’s the little things. While it might not be the prettiest organized pantry you’ll ever see, I’m really happy with it. Everything is in it’s place, I can see things clearly and it’s not a total disaster. And it didn’t cost me a million dollars either. Win-win-win! 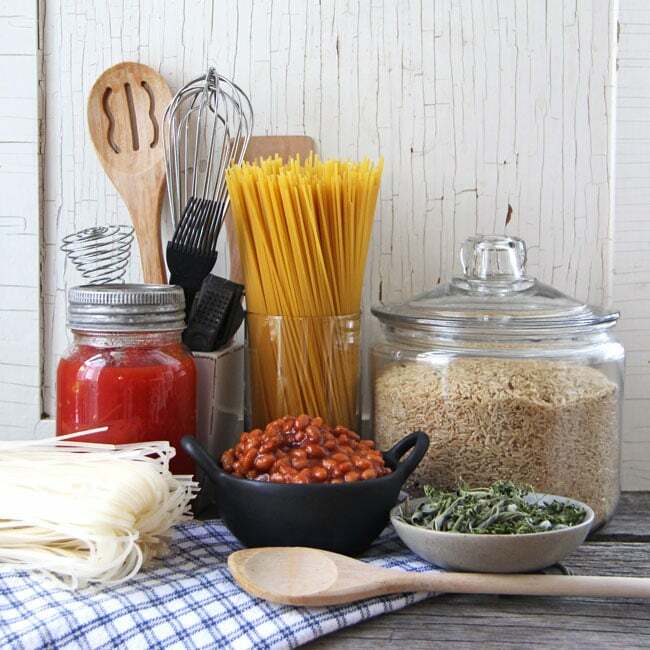 Wondering what to stock up on in your pantry? 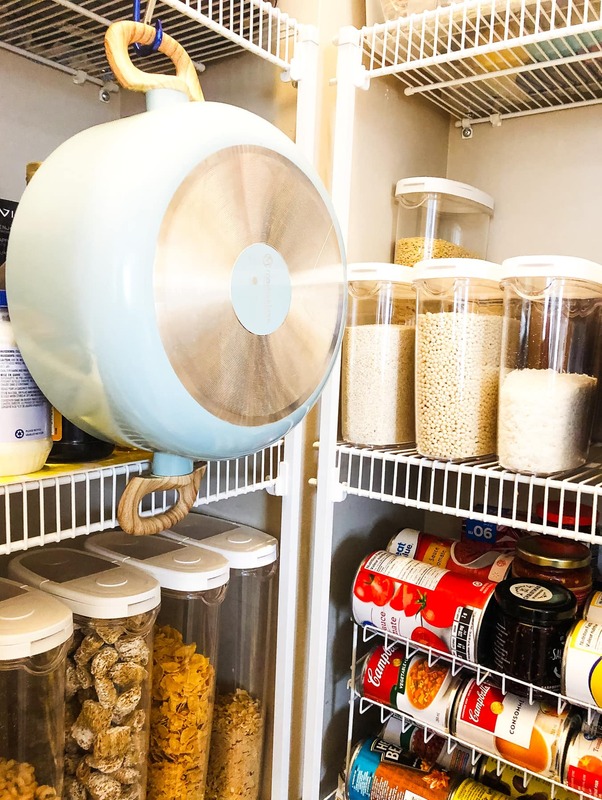 I overhauled my pantry back in the fall and it has been such a game changer! I really like “de-canting” things as much as possible, into clear bins. But you are so right about the cost! It seems crazy to me that plastic bins cost what they do. I lucked in at Costco and they were carrying sets of the OXO pop top bins so I bit the bullet and bought two sets. It was an investment for sure, but it has been really worth it for us. 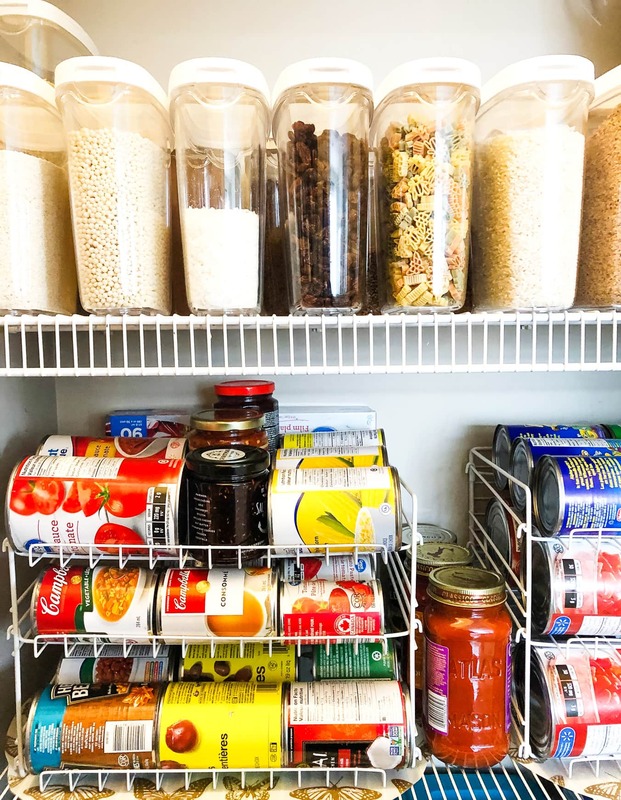 Your pantry looks great and I bet it is so functional! Way to go!